Use the form to send us an email and you will be contacted by one of our sales representatives. Waterproof flooring is quickly becoming a very popular flooring choice. Homeowners love it due to its’ water resistant properties and durability. This popular product offering is available and manufactured by many of the top flooring manufactures providing peace of mind to the homeowner. Since this product is waterproof it is ideal for installation in high moisture areas such as: bathrooms, laundry rooms and basements and kitchens. Not only are these products great for high moisture areas, but beautiful as well! You will find many beautiful style and color choices available. Looks such as stone and hardwood; exotic bamboo; walnut; and other wood species. Regardless of the challenges your household faces, waterproof flooring offers a commercial-grade durability at a price you can afford. It can be installed throughout your home or in any room you choose. The unique construction offers a thicker and enhanced urethane coating which results in a resistance to stains, scratches and wear. This makes for easy cleaning, and is pet friendly too! Waterproof flooring is very easy to install, allowing you to makeover your basement, bathroom, laundry room or kitchen in just a few hours. No need for a long, drawn out prep time – and it can even be installed over your existing tile or vinyl. With Waterproof flooring, just pick your color and style and quickly transform your room from dull to dazzling! 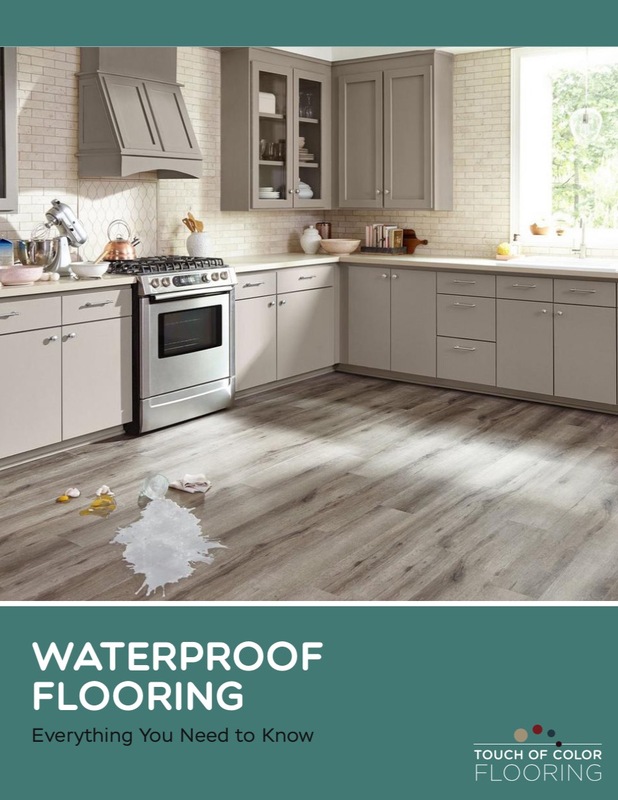 *While many floors are water resistant, it is important to note what the flooring industry means when they claim something is “waterproof.” When exposed to water, “waterproof” floors will not swell, buckle or lose integrity. They will also continue to create a secure bond if exposed to water. They do not act as a waterproofing barrier that protects the subfloor or surrounding structures. Some products shown are available at the design center location only.